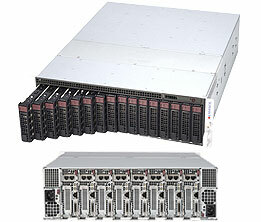 Supermicro new MicroCloud SuperServer SYS-5037MR-H8TRF is a 3U rackmount with 8-Node UP modular server to the high-density cloud computing solution based on the blade server platform. >> 3U chassis share power supply. Single CPU socket of Intel® LGA2011. Support Intel® Xeon E5 2600 series CPU (not over 135W). - 2x RJ-45 ports for GbE LAN, 1x RJ-45 port for IPMI dedicated LAN. LEDs: Power, Hard drive, Networking, & System Overheat, & UIO LEDS. Two 3.5" drive bays with HDD hot-swap tray. need to buy the tray converter if use 2.5" device.